Rayong-Pattaya Ladies Circle (RLC) has announced their 2nd Annual Red Carpet Ball to be held at the Amari Pattaya on Saturday 8 November. Last year the expatriate community packed the ballroom at the Hard Rock and was wowed not just by the spectacular ball, but also by the Hollywood glitz and glamour, a fashion show, and a Latin dance exhibition. The Red Carpet Ball overnight established itself as the expatriate highlight for 2014, and the 2015 event is now eagerly anticipated. Once again the RLC has committed the funds raised from this event to go to Women With a Mission (WWM), a not for profit private organisation who are celebrating ten years of operation in Thailand. Pattaya is home to several large charitable institutions, so who are WWM, what do they do, and why do they receive continued broad community support? Bronwyn, Kylie, and Rosanne (WWM) receiving an award from the Father Ray Foundation for their work with the handicapped. On December 26, 2004 a tsunami devastated large parts of SE Asia, including parts of Thailand’s southern region. While money and aid was flowing into Thailand from local and international sources, there were still many parts of southern Thailand that fell between the gaps. Bronwyn Carey, who had a career working on community projects in Australia, and had headed the PILC Welfare Group in Thailand, saw the need and sent out a message for help. 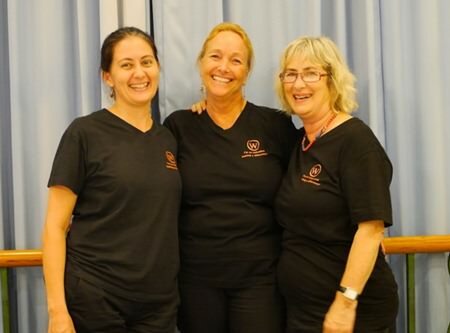 Rosy Diamente and Kylie Grimmer, also heavily involved in local charity work, put up their hands and together it was these three ladies who made an initial trip to the southern provinces of Thailand very soon after the tsunami, with the intention of making a one-time contribution. Students from Sang Ga U School on Koh Lanta wearing Jesters T-shirts. Jesters sponsored their lunches through WWM after the tsunami. Coinciding with the planning of their trip, the Father Ray Foundation contacted them advising that funds that had been donated from the UK for tsunami aid and they were wanting a reliable channel to deliver the aid on to the ground without the inefficiencies of a large NGO or high administration costs. The Father Ray Foundation is largely Pattaya-based, but they would initially assist WWM with setting up initial contacts and an investigative trip through the Catholic network in southern Thailand, and continue to partner with them today. Khru Boon Choo and Rosanne Diamente with trainers from Sattahip Hospital training staff at the Baan Khun Boon Choo. Helping Hands Pattaya, as they were originally known, was one of the earliest offerers of aid to visit the area, travelling to Krabi and the islands of Lanta Yai and Noi, where they saw first-hand the devastation. They met and talked with survivors, visited hospitals and were taken to see an overflowing make-shift morgue in Krabi where they were shown the process of body identification. Rosanne working with Tangmo, who is blind, at the Khru Boon Choo Centre in Ban Chang. HHP, after their initial thoughts of a once-off contribution, chose small-scale projects where they could provide direct practical assistance that did not conflict with the mainstream aid coming in from the Thai Government, Thai Red Cross or other large NGO’s. HHP quickly identified that the most effective use of their expertise and funds would be to work within the communities supporting women, children and schools. Laurie Bastien, a volunteer working with WWM, working with Nung at the Khru Boon Choo Centre in Ban Chang. Most families in the region had relied on fishing or farming both as an income and a source of food. The fishing fleets had been mostly wrecked and the farm land heavily salinated with seawater. These projects would require major funding and would take time to rebuild, but in the meantime people were in dire need of food. 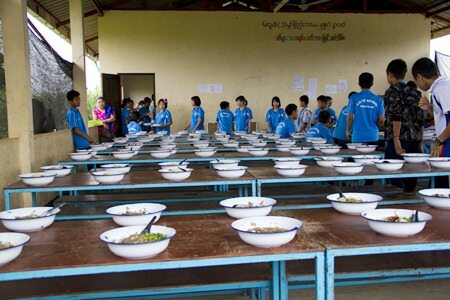 A first project was the provision of school lunches, with support from Jesters Care for Kids, for the 58 students of Sang-Ga-U School, children of the small sea-gypsy community at the southern tip of Koh Lanta Yai. Women with a Mission’s Kylie Grimmer, Rosanne Diamente and Bronwyn Carey gather for a group photo at their last fundraising golf tournament at Phoenix golf course. Soon after, HHP met with Senator Meechai’s PDA, an organisation that had always championed village self-sustainability, and convinced them to help trial a school lunch farm project for Wat Koh Lanta, a school with over 200 students, also on Lanta Yai Island. With initial emergency funding from Pattaya Sports Club, they assisted the school to set up a small farm (vegetables, mushrooms, chickens and fish) to grow food to provide lunch for the school children, their only substantive meal for the day. The pilot project was successful and the beginning of seven school farms over three years. By May 2005, just five months after the tsunami, the school farm projects were already feeding 1,000 children each day. 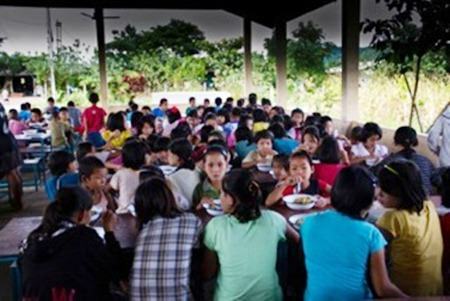 Pic of the children in the new canteen at Hway Ka Loke Boarding House on the Thai Burmese Border. In other tsunami projects, HHP provided sewing machines for women in Krabi enabling them to start up their own micro-enterprise to support their families, supplied milk products over three years to infant survivors of Phang-nga Province and took on a few individual cases, such as providing diapers for a baby boy born to a mother diagnosed with cancer soon after surviving the tsunami. Funding came via family, friends and local charities, including Rayong Ladies Circle and Pattaya International Ladies Club. 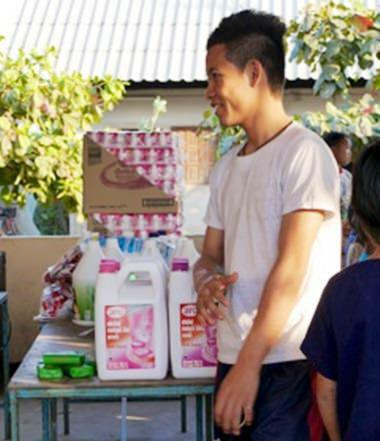 In a lasting legacy from the initial milk project, the UK-based Thai Children’s Trust, who initially channelled their funds through HHP, continue funding Baan Than Namchai, an orphanage established 6-months after the tsunami. Students from Regents International School with the WWM team working to build fish tanks to help set up small businesses for families with handicapped members. After initially committing to a once-off form of assistance that stretched to a year, after three years their work in the tsunami areas gradually started to wind down as the projects achieved their goal of becoming self-sustainable and self-managed. After a short break, and a renaming of their group, they started working as ‘Women With a Mission’, working with the local governments helping to improve the lives of the severely handicapped (both children and adults) in Chonburi and Rayong. Along with help from the Redemptorist Center in Pattaya, they embarked on a campaign to build and renovate toilets, and install ramps to improve wheelchair access in homes of the handicapped to give them the opportunity for better quality independent living. Rosy led this project as Kylie and Bronwyn were living out of Thailand at the time, and today continues to work tirelessly and passionately, driving WWM’s handicapped projects. Students from Regents School with the family after finishing building catfish tanks for them as a Round Square Week project. WWM was gradually starting to expand their focus towards migrant students living in north-western Thailand and it was during this time that another natural disaster struck; Cyclone Nagis in May 2008, which devastated Burma and damaged migrant schools along the border areas of Thailand, specifically the Burma-Thai border town of Mae Sot, in Tak Province. An immediate call for support was put out by WWM, raising B50,000 to fund repairs to a migrant school, which led to WWM being asked to assist with clothing and rice. Friends, the local Thai community and local organisations and businesses rallied and 2 containers of goods (1 x 20ft, 1 x 40ft) were sent to Mae Sot for the people of Burma. 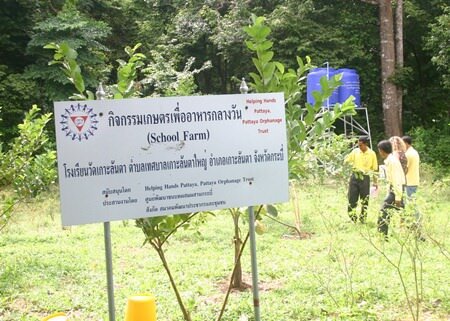 The first school lunch farm project in Koh Lanta after the tsunami. Following this, and using their experience from southern Thailand, they began to initiate school lunch farm projects in the border area, and also gave assistance to build mushroom growing ventures so the mushrooms could form part of the children’s diet and that part of the crop could be sold, providing much needed income for the schools. Hway Ka Loke School and Boarding House came to their attention as one of the largest Karen migrant schools in the area. Housing 250 migrant children, with a further 100 Karen day children from the surrounding area using it as their only hope for an education, it was struggling severely to make ends meet without regular funding support. Since taking on the role of principal funders for HKL, WWM have been providing daily meals for boarding house students and school lunches for all students, a mere 850 meals a day! They have rebuilt and improved school buildings and dormitories, built a new canteen, boys’ boarding house and installed a deep-water well with funding from dear friends, Mary and Matthew Kelly, and a UK-based Foundation. They have been paying teachers’ salaries, meeting running costs and subsidising the school’s pick-up truck. Regents International School students funded construction of a computer room, enabling access to the internet, and a sewing room so that the older girls of HKL could learn and develop new skills. Step by step, WWM together with their friends and supporters, have been making improvements to the lives of these children. Hedie Sizoo teaching sewing to students at CDTC school. At the same time WWM had visited Umphium Mae Refugee camp at the request of a local organization, as conditions in the camp were one of the worst. The camp was full of children, some orphaned, but many just sent across by their parents to escape the danger. These children were living in squalor, crammed into makeshift huts, little sanitation, little food, and only very basic education facilities. WWM made the decision to help a particular boarding house, and again focused on improving the lives of the young, with additional food, clothing, books, and basics such as candles so the children could study in the evenings. Giving out hygiene supplies to the students at Hway Ka Loke Boarding House. In order to provide assistance to families struggling to support severely disabled family members, WWM again led by Rosy, and with the help of the local municipality set up small-scale fish farm projects in our local Pattaya community where they helped build fish tanks, provided the fish fingerlings and food, and then worked with these families to grow fish for their own consumption, but reserving part of the stock for sale so they could generate income. Some of this was to buy more fingerlings and fish food to keep their project running, with enough left over to make a small profit. In all, twenty-five family-based fish farm projects were initiated. They attracted supporters for this project, again including Regents International School, who had encompassed it in their ‘Round Square’ program as a community project. This has helped form a strong enduring link between WWM and Regent’s with the school now providing a full boarding scholarship to one of the Karen students from Hway Ka Loke School. Students in their new uniforms in the classroom at CDTC school. WWM continue to work with the disabled in our community. 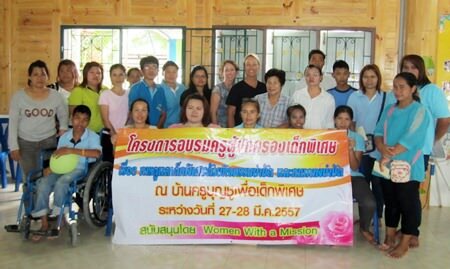 When WWM first visited Baan Khru Boon Choo two years ago, the center housed 56 children with a variety of disabilities. Today there are over 110 young disabled people attending the center, either as day students or boarders. WWM has been able to set up a special classroom for children with autism and cerebral palsy and has provided training for the staff. WWM volunteers, with professional skills including speech therapy, physical therapy and teaching the deaf, have been working at the school for the past two years and have made dramatic improvements to the programs, and importantly, to the quality and prospects of the children’s lives. Students using the new computer room funded through Regents Gold Fish Program. Ten years has seen a lot of hard, dedicated work for the three ladies who run this private organisation and they have accomplished much in areas where the need is greatest. Importantly they commit their time at no cost, and personally supervise the programs to ensure every baht is spent wisely, and where possible, try to make all programs self-sustaining. The Red Carpet Ball is not just a celebration of their 10 years of dedicated work, but recognition of WWM’s important work throughout the Thailand community. They have much gratitude for their supporters and donors over the past ten years and know that without their support, none of this would have been possible. Getting ready for lunch at CDTC school. 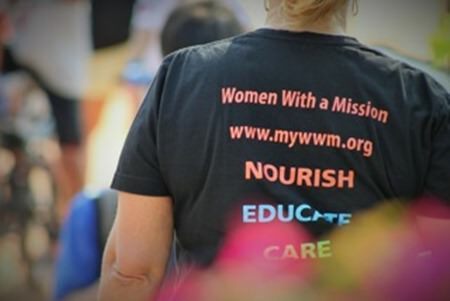 WWM subscribe to the beliefs of ‘Nourish, Educate and Care’, funding daily meals, including school lunches; providing teacher salaries, teaching materials and school uniforms; offering access to services and resources to disabled and underprivileged children and their families, and more information can be found on their website – www.mywwm.org. Staff at Baan Khru Boon Choo Centre with Laurie Bastien, Rosanne, and Wanji at the end of 2 days of training by Laurie Bastian.